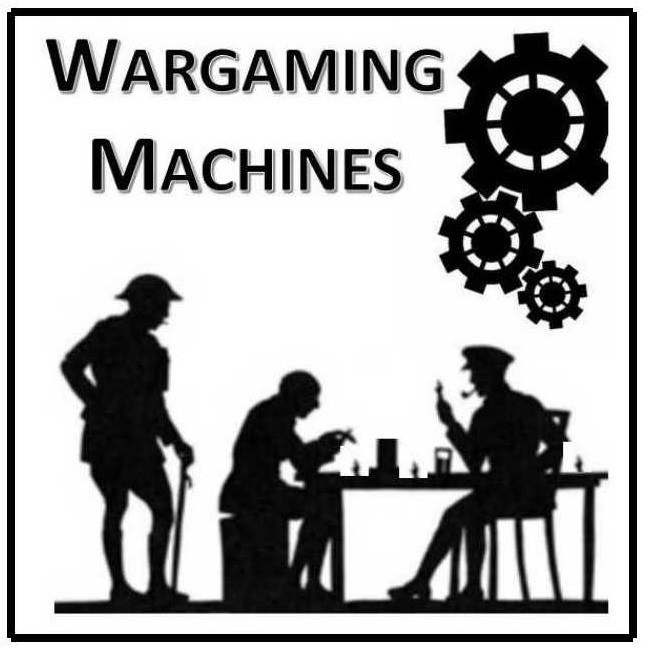 While it may seem a bit of an oxymoron to use computers or devices in a toy soldier game, it is important to remember that H.G. Wells himself did not approve of the use of dice in wargames, as they detracted from the skill involved in play. And yet, we associate toy soldier wargames with handfuls of six-sided dice. In the present offering, six-sided dice are still rolled by the handful - the computer is merely a tool for setting up the course of the engagements to be fought as you lead your regiment of shiny, brave toy soldiers toward some notional Objective. With the Colours in the Late War emerged as a result of wanting to have a game where no more than a dozen toy soldiers were required for each side, yet one that would still provide a reasonable game experience set within a larger battle. All that is required for play are the requisite two dozen soldiers, some 6-sided dice and a ruler, a device or computer to run the program, an objective marker of some kind (a hill, a building, etc. ), and some small terrain pieces to represent obstructions (clumps of lichen, small rocks, trees, hedges, walls, etc.) in case these are encountered during play. The playing surface is envisaged to be a dining-room table, providing a distance of three or four feet between the starting point and the Objective. 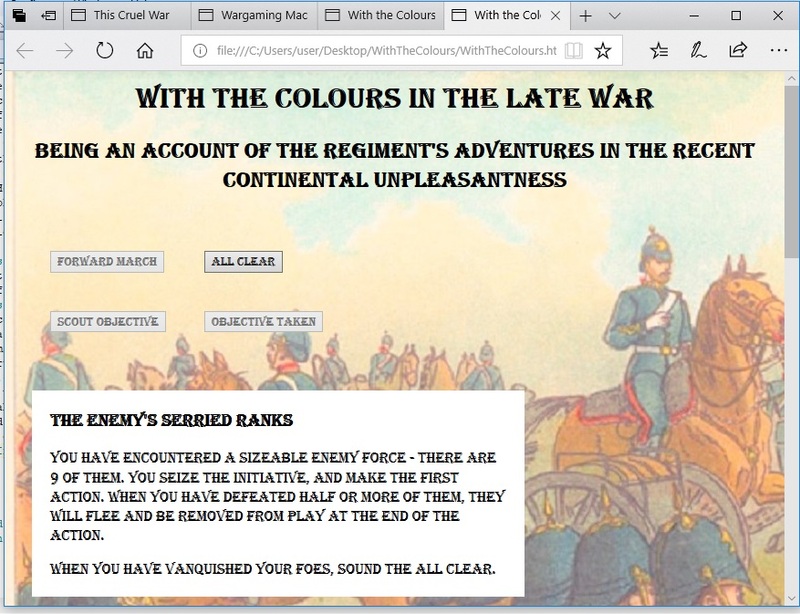 Because of the computer, many thing can happen during the Regiment&apos;s adventures which do not typically happen in toy soldier games: players are able to be mentioned in despatches, to win the Victoria Cross, to gain promotion, and otherwise be recognized for their heroic deeds. At the same time, they can be cashiered, subject to the faulty orders of higher command, penalized for insubordination, and even scapegoated. Set in a non-specific "recent Continental unpleasantness," the game is an Anglo-centric depiction of Edwardian warfare. However, if we substitute the word "Colonial" for "Continental" in the subtitle, it could be used for other conflicts. If we substitute the phrase "Iron Cross" for "Victoria Cross" it could be Prussian, and so on. It is very generic in how it can be used. The game is divided into &apos;engagements&apos;. 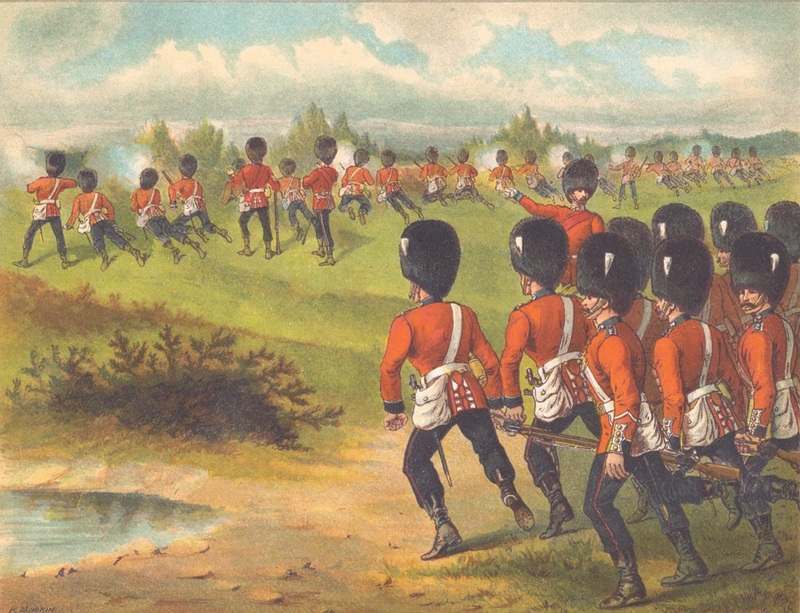 A player sets up their Regiment at one end of the table, with the objective at the far end. They click the "Forward March" button, and the event which will inform the engagement is presented. It may be enemy troops, long-range shell fire, francs-tireurs, or simple maneuver. It may involve the encoutering of an obstacle. Another player (or a referee if there is one) will play the enemy soldiers. Once complete - usually at most a matter of three or four &apos;turns&apos; - the player will click the "All Clear" button and see if there are any consequences for his actions. The next player then goes. When a player comes within 18 inches of his Objective (players may each have their own, or may have to race for the prize) it is scouted. The following engagement will be a make-or-break fight to take the Objective or die trying. In this fashion, players can make the most of a small toy soldier collection, and do so in a way which goes well beyond what many other toy soldier games provide. Because they alternate running their own Regiment and the enemy soldiers, no single player has to deal with a lot of down-time, and everybody gets a chance to game with whatever variety of forces is available. So overcome whatever prejudices you might harbour about using a tablet for a toy soldier game, and see if you can lead your brave and shiny lads to fame and glory, or end up receiving the white feather for cowardly acts which you did not (of course) commit. You can find With the Colours in the Late War here. All dice are ordinary six-sided dice. Players alternate clicking the Forward March button. They will play until they can sound the All Clear (by clicking the button at the game&apos;s request, at the end of the group&apos;s action), then the next player gets a turn. Each segment of play is an engagement. The Objective is set up on the far end of the table. Player figures are officers who always are allowed to save on a 3-6 on one die when made casualty - each player gets one. If made a casualty, the player is out of the game. Player commands should be at least a dozen figures, including officer and standard bearer, with perhaps an artillery piece and crew. Commands of more than 24 figures should be split into two or more player commands. While one players makes his actions, another player (or a referee) runs the enemy. When acting, figures may choose to move, shoot, charge, or fight. Friendly and enemy forces alternate making actions as a group until one side or the other is defeated. A normal move is 6 inches on foot, with artillery, or with gatling guns, or 12 inches mounted, and may involve any changes in direction or facing desired. Mounted soldiers may not shoot. Foot figures may shoot up to 12 inches, killing their target on a 6. You may not shoot at an enemy soldier who is in contact with a friendly one. If the target is in cover, they roll a die when they are shot (including by gatling guns and artillery, too) - on a 4-6 they survive. When artillery shoots, it may change facing up to 45 degrees. Draw a line 24 inches straight out from the muzzle of the gun. Any figure within 1 inch of the line must roll a die - on a 5 or 6 they are killed. Artillery must reload after firing, which requires two figures to make an action (count as a Move). Gatling guns may also change facing up to 45 degrees when firing. They will make every figure within an arc of 90 degrees centered on the direction the gun is pointing, and within 12 inches, roll a die - on a 5 or 6 they become a casualty. Before firing, the gatling gun must roll a die - on a 1 it will jam for the turn, and no one will be affected by the fire. Artillery, if loaded with cannister, will fire as if a gatling gun but without the roll to jam. At least one figure is required to fire artillery or a gatling gun. After moving, artillery and gatling guns must spend an action setting up before they can fire - they may change facing but not location. Charging involves making a move (as normal) into contact with an enemy soldier. Roll a die, and on a 5 or 6 (for foot) or a 4-6 (for mounted) the enemy soldier is made a casualty. Fighting is the same as charging, except the soldiers will start in contact, so there is no movement. Encounters with the enemy will take place at a distance of between 7 and 12 inches - roll a die and add 6 to it to determine the distance unless instructed otherwise. Enemy will appear to the front of the player&apos;s unit unless otherwise noted. Groups of 6 or more of the enemy may have a standard bearer and/or officer. Groups of 9 or more must have them if possible. If an enemy standard bearer is killed in a charge or in hand-to-hand combat, you have captured their colours. If, at the end of any engagement, you have lost your own colours to the enemy, the game is over for you - you are cashiered in disgrace. When within 18 inches of an Objective, it may be scouted by clicking the Scout Objective button instead of the Forward March button (that player continues until the Objective Taken button is clicked, or their forces are defeated). Players may join forces if they are close enough to support each other. Simply add the supporting soldiers to the acting player&apos;s force for that enagagement. When an engagement is finished, all involved players will share in the rewards.